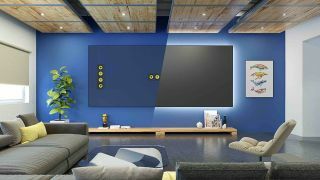 The What: Since launching in 2014, Screen Innovations’ Slate ambient light-rejecting projection screens have been a driving force for the company. Building on this success, the company has introduced acoustically transparent perforated versions its Slate and Pure screens, the Slate AT and Pure AT. The What Else: Slate AT has been a long-term SI goal based on its vision that the screen should not be a distraction for the viewer, instead adding to or improving their experience. According to Tom Nugent, SI’s chief of technology, who led the project, developing a perforated material was an arduous process. “It has not been easy,” he said. “Perforating is difficult in its own right, but working with a 106-inch-tall material is nearly impossible. We are perforating over 28,000 0.55mm holes for every square foot, clearly a daunting task. The Bottom Line: Slate AT and Pure AT screens are available to order now and can be configured on all the company’s screen form factors such as Zero Edge, Zero-G, Fixed, and Motorized.